Most cool mist humidifiers you can find these days are evaporative or use ultrasonic technology, but that's not the case for the Sunbeam Cool Mist Impeller Humidifier. An impeller humidifier uses a disc that rotates rapidly, flinging water toward a diffuser. The diffuser breaks down the water into a fine mist, which is then released as invisible humidity into the air you breathe. Regardless of what type of humidifier you choose, the resulting humidity is the same, so don't believe that ultrasonic, evaporative, or warm mist are better than the impeller type. To find out more about this humidifier and why it might be a good fit for your home, keep reading this review! 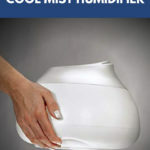 Two things might surprise you right off the bat with this Sunbeam cool mist humidifier. First, it’s a super affordable unit that works as well as the more expensive humidifiers on the market and doesn’t need a humidifier filter. Second, it’s smaller than you’d expect for a humidifier with a 28-hour runtime. This humidifier easily fits on a tabletop or a nightstand, but the tank is larger than you might expect – it holds more than a gallon of water. Speaking of the tank, the design of this thing is, in many people’s opinions, much better than other popular brands’ humidifiers. The round base is the tank, so all you have to do is remove the top, set the tank in a sink, and fill it up. 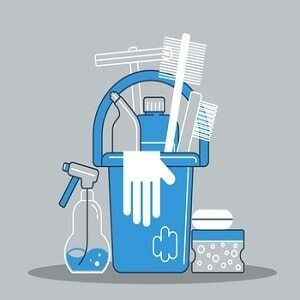 Cleaning it is also ridiculously easy because there are no nooks and crannies that you have to try to reach. For a simple way how to clean is to soak it in a light bleach and water mix or use white vinegar, rinse it well, and then wipe it down. That sort of cleaning should be performed at least once per week, and it’s suggested you do so with any humidifier – especially cool mist humidifiers, as bacteria and mold could grow. With that said, Sunbeam has treated the plastic of this humidifier with an antimicrobial treatment, which helps inhibit the growth of bacteria and mold. The way this impeller humidifier works is a little different from the other humidifiers you may be familiar with. A disc spins quickly, which pushes drops of water into or onto a diffuser, and that’s how a fine mist is created. The humidity is the same as all the other humidifiers’ humidity, but there’s one big difference between the impeller type and all the others. Pools and puddles of water that seem to inexplicably show up near or around other humidifiers won’t appear around an impeller humidifier because of the design and method of this type of unit. The Sunbeam Cool Mist Impeller Humidifier doesn’t have a fan inside it, so it won’t make nearly as much noise as an evaporative type of humidifier. It should operate quietly, with a few bubbling sounds here and there, especially when water runs low in the tank. One noticeable effect of using a cool mist humidifier like the impeller and ultrasonic types is a fine white dust that seems to get all over your stuff. 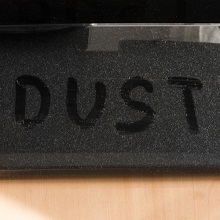 That white dust is nothing more than the minerals in the water you’re using in your humidifier. You can include an additive to distill the water or use distilled water to reduce the white dust that’s produced, but it isn’t necessary. The white dust is harmless, but it may be a bit of an annoyance. Once you get the tank filled and plug in the unit, it should be working immediately. In fact, there’s no button to press at all. You simply plug it in to turn it on and unplug it to turn it off. What this also means is that there are no speed settings. You can’t choose low or high, and there’s no timer. On one hand, this simplifies the process and makes it easy to use this unit, plus it keeps the price of the humidifier low. On the other hand, it removes a bit of choice and usability of the unit. When the humidifier is working, you may question if it’s actually putting any humidity into the air. The resulting fine mist is so fine that you’re unlikely to see it. So, it’s hard to believe that you’re getting any extra moisture. As long as the water in the tank is going down, the unit should be working. Also, you should notice some of your symptoms from dry air waning. Your cough, congestion, and even allergy symptoms should be lessened. 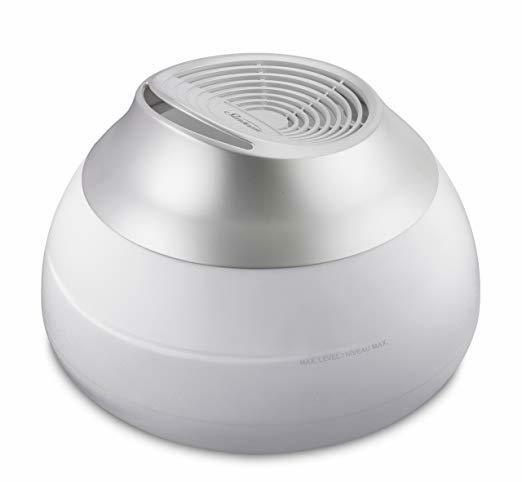 As is the case with all cool mist humidifiers, this one is safe to use anywhere. There’s no boiling water and so it’s safe to use around children because there’s no risk of burns or scalds. And in the case of a defective unit, Sunbeam takes these broken humidifiers back and will either repair or replace it for up to one year after the purchase date – so, save your receipt! The Sunbeam Cool Mist Impeller Humidifier has a known issue that even the manufacturer is aware of and offers a solution. If you get the tank filled, put the cap back on, and plug in the unit only to hear a loud vibrating noise, you need to make some adjustments. The lid must be placed correctly, and it’s even mentioned in the directions that come with the unit. Readjust and find the right balance to eliminate the vibrating, grinding noise. You should expect some humming white noise out of this, though. When it comes to features and benefits, most humidifiers come with a long list. The Sunbeam Cool Mist Impeller Humidifier has a much shorter list, though, which increases its ease of use. At 1.2 gallons, the tank size of this humidifier is much larger than you might expect. What this means is that you won’t have to refill it often. Though it isn’t totally hands-off, you may only have to refill the tank once per day or night, rather than several times per day. And if you unplug it after a night of humidity, you may only have to refill it every couple of days. This unit is less than a foot wide, making it a good choice for any bedroom nightstand, small table in any room, or countertop. It’s an orb-like design and it doesn’t have a bunch of angles that could get in the way of other items. This humidifier should fit wherever you need it. With such a large tank comes a long runtime. Sunbeam estimates this humidifier has a 28-hour runtime, which is much longer than similar humidifiers of the same size. Most people have noted that it comes in at about 24 hours, which still means you won’t have to refill the tank very often. The impeller type of humidifier has a benefit over evaporative and ultrasonic cool mist humidifiers because it keeps the water inside the tank or the mist in the air. Water shouldn’t collect at the base of the unit, on your floor, or a table on which the humidifier sits. The lack of speed settings, an on/off button, timer, and nightlight could be considered a bug or a feature. Having fewer options increases the ease of use of this unit. All you have to do is fill it up and plug it in to get it going. Sometimes it’s easier to make a decision on a product after reading what others thought about it after purchasing and using it. This is a consensus of several reviews from consumers who bought and used the Sunbeam Cool Mist Impeller Humidifier. There seems to be a split right down the middle when it comes to opinions on humidity output. Many people pointed out that the mist is not visible, so it didn’t seem as though moisture was added to the air at all. Several others said the unit was definitely working because they were waking up without dry coughs, and the water level was going down. Overwhelmingly, there are a huge number of reviews out there that mention how noisy this machine is, but equally so there were reports that the noise isn’t that bad. Some referred to the noise being as loud as a plane, but there were following reviews saying it was like white noise. So, this could be subjective, or some people received defective units – or they didn’t adjust the lid properly. One thing everyone seems to agree upon is that cleaning this unit is a breeze. Not only is the tank dishwasher safe, it’s also designed to make it easy for you to reach in and wipe things down, with no nooks and crannies where bacteria can hide. It seems that defective units are shipping regularly, which explains a lot of the negative reviews. Some people reported having water in the tank and the unit plugged in, but the water level remained the same for days. The good news is that Sunbeam offers a one-year warranty for such cases. Just like cleaning the tank of this unit, filling it is equally easy. The wide mouth makes it super simple to fill in a sink or with a pitcher, and this was generally agreed upon by reviewers. Just remember to only fill to the fill line, otherwise you could end up with leaks. While some people had no problem with the lack of an on/off switch, some people were perturbed by it. Plugging it in and out to turn it on and off shouldn’t be much of an issue, but it could be seen as an inconvenience. When it comes to cost, you can’t really beat this Sunbeam humidifier. It’s an incredibly affordable unit, especially when you consider the size of tank and the runtime. The tank can hold up to 1.2 gallons of water, and it puts out humidity at the rate of just a little more than a gallon over 28 hours. Most people said they got about 24 hours out of each tank, but that’s still impressive given the price of this humidifier. Overall, the Sunbeam Cool Mist Impeller Humidifier should be a good value for what you get. It could be considered oversimplified, but for those who just want to find a way to increase the humidity in the air they breathe and not have to worry about options and settings, this could be the ideal cool mist humidifier for you.